For the film, see Hardcover (film). If brisk sales are anticipated, a hardcover edition of a book is typically released first, followed by a "trade" paperback edition (same format as hardcover) the next year. Some publishers publish paperback originals if slow hardback sales are anticipated. For very popular books these sales cycles may be extended, and followed by a mass market paperback edition typeset in a more compact size and printed on shallower,[clarification needed] less hardy paper. This is intended to, in part, prolong the life of the immediate buying boom that occurs for some best sellers: After the attention to the book has subsided, a lower-cost version in the paperback, is released to sell further copies. In the past the release of a paperback edition was one year after the hardback, but by the early twenty-first century paperbacks were released six months after the hardback by some publishers. It is very unusual for a book that was first published in paperback to be followed by a hardback. An example is the novel The Judgment of Paris by Gore Vidal, which had its revised edition of 1961 first published in paperback, and later in hardcover. Hardcover books are usually sold at higher prices than comparable paperbacks. Books for the general public are usually printed in hardback only for authors who are expected to be successful, or as a precursor to the paperback to predict sale levels; however, many academic books are often only published in hardcover editions. Hardcovers typically consist of a page block, two boards, and a cloth or heavy paper covering. The pages are sewn together and glued onto a flexible spine between the boards, and it too is covered by the cloth. A paper wrapper, or dust jacket, is usually put over the binding, folding over each horizontal end of the boards. Dust jackets serve to protect the underlying cover from wear. On the folded part, or flap, over the front cover is generally a blurb, or a summary of the book. 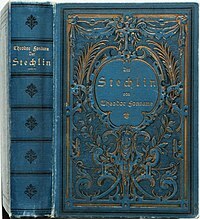 The back flap is where the biography of the author can be found. Reviews are often placed on the back of the jacket. Many modern bestselling hardcover books use a partial cloth cover, with cloth covered board on the spine only, and only boards covering the rest of the book. Old hardcover books at the Merton College library. ^ Post, Chad W. (2009-06-22). "In Praise of Paper-Over-Board - Publishing Perspectives". Publishing Perspectives. Retrieved 2013-05-07. ^ Neyfakh, Leon (2009-08-24). "The New Thing: Books Without Jackets". Observer. Retrieved 2013-05-07. ^ Bosman, Julie (26 July 2011). "E-Books Accelerate Paperback Publishers' Release Dates". The New York Times. ISSN 0362-4331. Retrieved 14 May 2011.